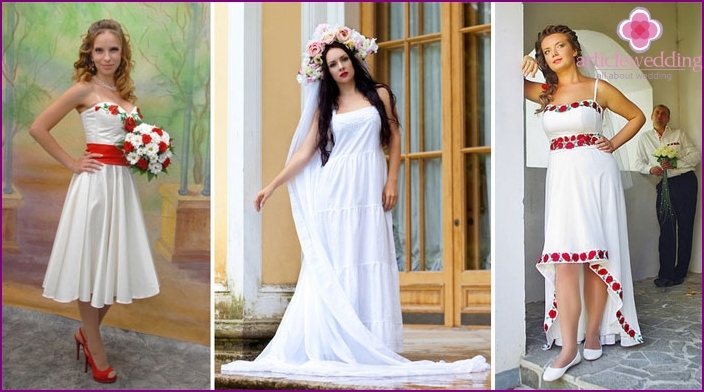 Some girls wish your wedding day to bemodern traditional long white dress, and other future bride, creating your wedding image, tend to stick to the Slavic subjects. 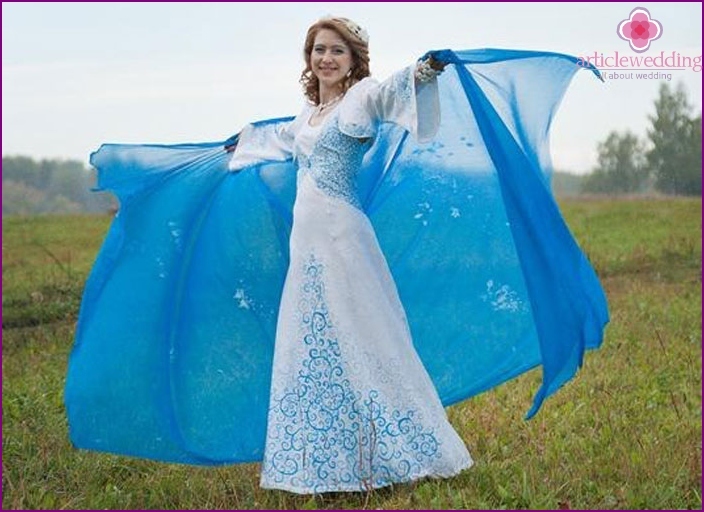 Dresses in Russian folk style look bright, unusual and creative. Brides who prefer dresses with ethnic overtones, very nice on the background of newlyweds who choose traditional attire. 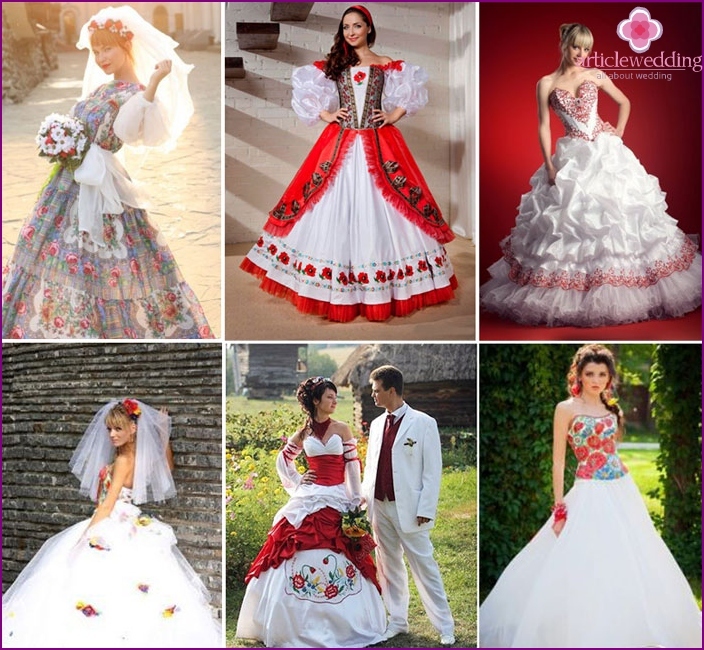 What are the wedding dresses in the Slavic style? The role of a headdress in ancient times played a wreathof fresh wild flowers, ribbons and hoops that were fixed on the forehead and nape. And after the obligatory wedding bride hair braided. forming two tight braids, wrapped around their heads, wore a handkerchief with innovative, ochipok or magpie. Wedding sundress embroidered with gold, silver ornaments, decorated with braid, bright beads. Combinations of these colors is traditionally widelyused for sewing patterns wedding for brides. Designers use Russian motifs in modern bridal fashion various styles, ranging from classical to popular ethno combined with baroque influences. The original colors of embroidery, gold, adorned with pearls, sequins, beads - all this will make the bride's clothes beautiful, irresistible. Good and well-torch sleeves, embroidered with small floral patterns. If you have planned a real Russian weddingwith all the ceremonies, you will likely want to wear on her wedding sundress, shirt, kokoshnik. In this case, the image of the bride to be as close to the ancient Slavic standard. This bride will look gentle, bright, original. It will be an interesting and spectacular version of the wedding dress, if the basis of its design to take the old-style Boyarsky, who has an original cut, rich decorations to include fur details. bodice embroidery patterns or colors. For a summer wedding is well suited linen dressin the Russian style. It groom will look original, romantic and decorative embroidery on it will create the image of the charming young girl. If the bride has a Slavic appearance, then this option will make her irresistible, will emphasize the beauty of the eyes and hair depth. 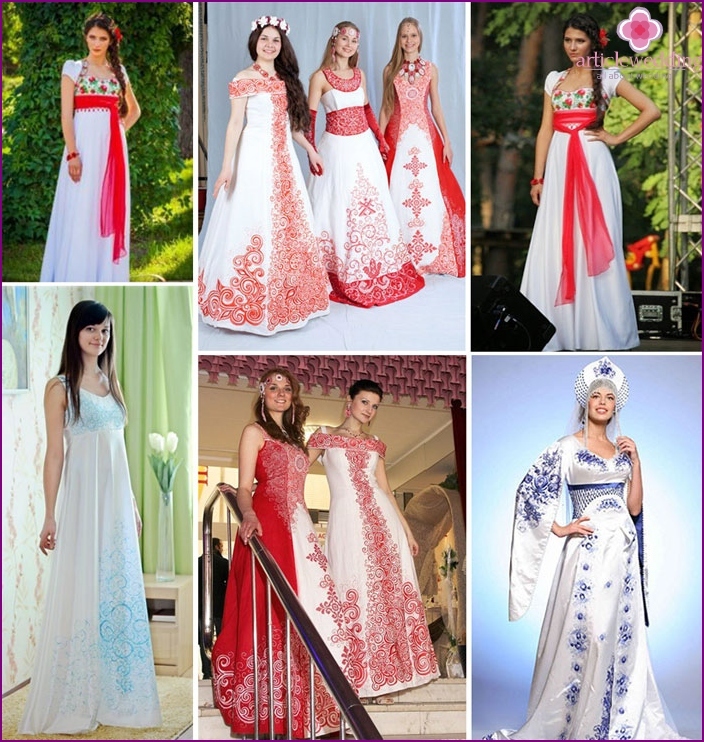 To dress the bride in the summer are perfect traditional Russian red or white tunics with embroidered ornament. Another option - a light dress with redembroidery, beautiful brim. The style of wedding dresses bride to create maximum comfort at the festival, unlike the heavy traditional finery with a mass of decorations. All the bride's figure flaws such clothing may temper, so she will look creative, beautiful. It is interesting to look like the bride who chosewedding dress a-line in the Slavic style. The peculiarity of it is cut, it goes smoothly from the bodice to the flared skirt. This style visually slim figure, so this type of dress sits perfectly on a girl of any build. The neckline is appropriate for this model in the form of deep and small cut-up line collarbone. Ruffles, long train dress will give a special beauty and artfully embroidered on the bodice with gold ornament or beautiful roses create a real flavor to the image of Russian bride. 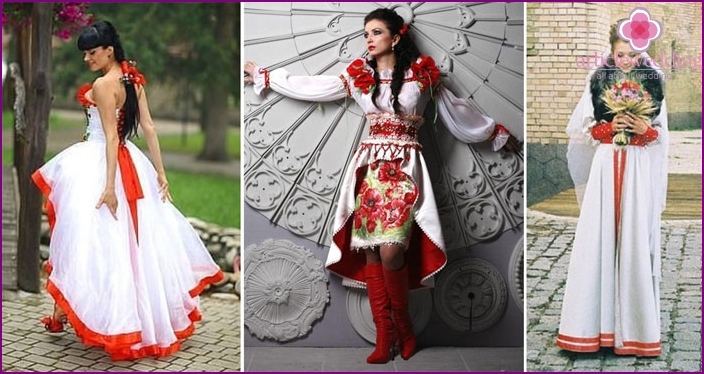 Wedding styles "Princess" type with lushmultilayered skirt may have a Slavic design. To create them using silk, tulle, lace and other materials. 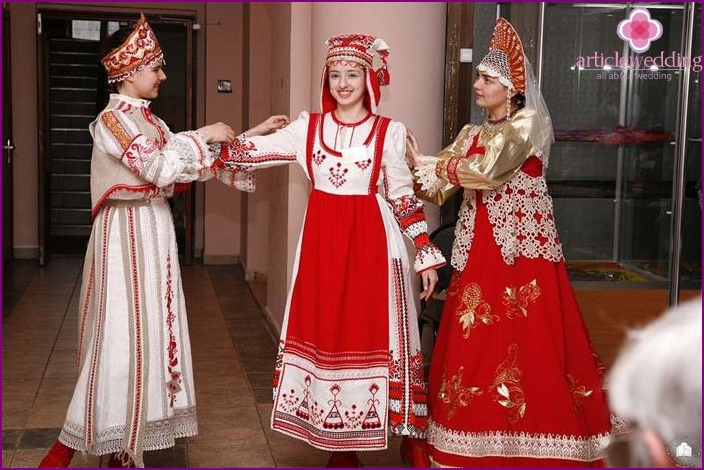 To dress has become the national colors, it is decorated with colored embroidery and frilly skirt complement, accents of red cloth. Especially effectively looks like a model, "Princess" with red embroidery on the corset. Fata - an essential element of the decoration of the bride. For the Slavic way of her bride embroidered patterns, colors. Instead of tiaras in the Russian style of bride is best suited kokoshnik - it will give the appearance of a newlywed special flavor. Fur hats are white reflection Slavic motifs, they are particularly suitable for winter weddings and will be perfectly combined with other accessories - boas, fur, muff. To complete the image of the Slavic neededred shoes: it could be shoes or boots (it all depends on the season). In winter, the dress is selected just two pairs of shoes, the bride to feel comfortable on the street and indoors. To decorate a girl to be quite appropriate earrings, beads, necklaces, bracelets large sizes. National scarves with patterns can be a highlight of the original style of the bride. 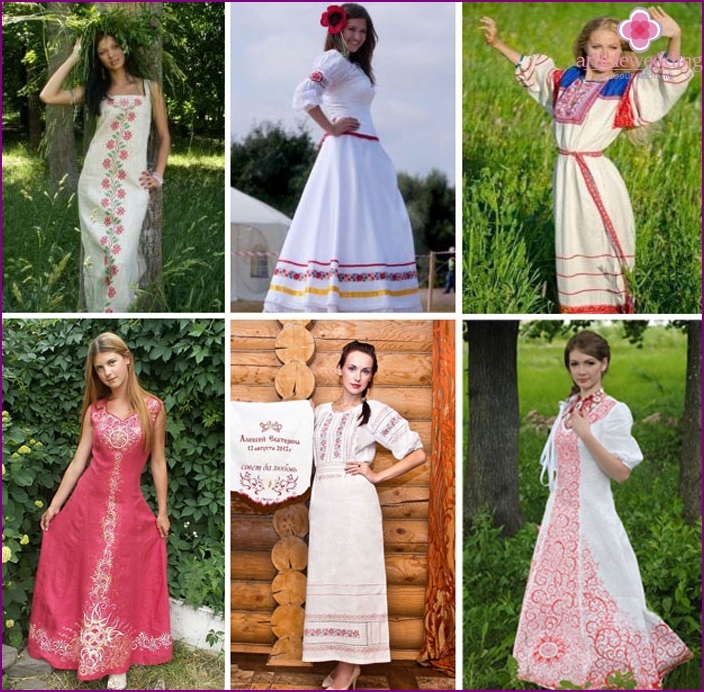 Slavic style clothing popular amongmodern girls who are going to tie the knot. Most designers use ethno-style to create exclusive wedding models. 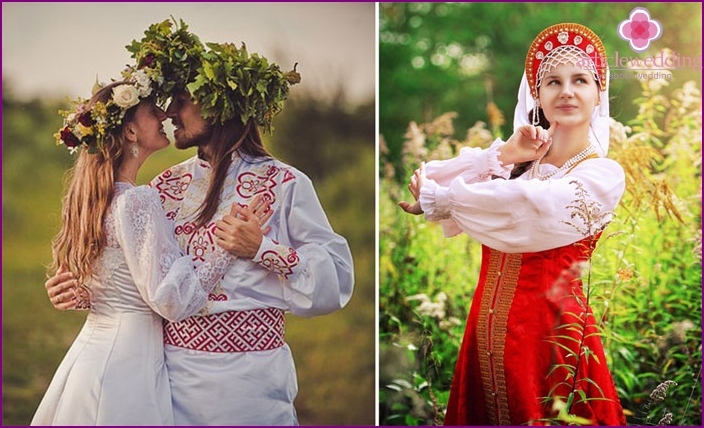 Many variants of the Slavic wedding dress style allows you to choose the outfit, corresponding to its requirements of any girl who wants to look at the festival reflect the Russian spirit.